What is a Rent Mother Nature Lease? 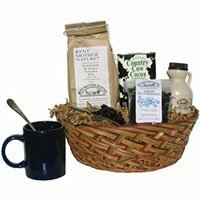 The 12” round wicker basket is filled with an assortment of New England treats to make a superb blueberry pancake breakfast: our pure, wood-fired grade A maple syrup (1/2 pint), stone-ground buttermilk & honey pancake mix (2 pounds), wild Maine blueberries (3.5 oz. ), & Vermont cocoa (8 oz. tin).